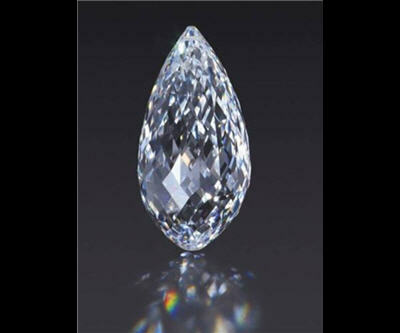 Auctioneer Christie's sold a 75.36 carat briolette diamond for $11 million in Hong Kong during a sale Tuesday. The sum set a new record for that particular style of gem — an elongated pear-shape cut with facets — which works out to $148,000 per carat. Its pre-sale estimate was in the range of $8.5 to $12.5 million. Christie's said it marks the third record setting sale in recent months. The auction also sold a diamond and emerald necklace for $5.7 million and a pair of ruby and diamond earrings for $3.9 milion. One of the most famous briolette diamonds is a 26o carat gem, centrepiece of a necklace given by Napoleon Bonaparte to his consort Marie Louise, that is is now housed in the Smithsonian.